WASHINGTON NAVY YARD — The Navy is preparing to release the request for proposals (RFP) for at least 10 Arleigh Burke-class guided-missile destroyers (DDG-51), with a presolicitation notice going out on Dec. 14 and the RFP set for release within the next month, the DDG-51 program manager told USNI News. Capt. Casey Moton said the multiyear contract, which covers Fiscal Years 2018 through 2022, would be written in a flexible way to account for some uncertainty in destroyer acquisition rates in the coming years. In the National Defense Authorization Act of Fiscal Year 2018, which has already been signed into law, the House and Senate authorizers gave the Navy permission to buy as many as 15 ships in the upcoming multiyear procurement contract. However, the House and Senate appropriators have not yet agreed to that: the House defense spending bill does not specify a quantity of ships for the upcoming contract, but the Senate defense spending bill allows for just 10 ships in the contract. Additionally, the DDG-51 program is one of the top two talked-about programs for early efforts in a Navy buildup to a 355-ship fleet, but the specifics of that buildup have not yet been hashed out. “For [the current fiscal year, 2018], I think we’re at Navy’s budget request, which is two ships, unless something were to happen in final conference on the approps bill,” Moton told USNI News. The NDAA added funding for a third ship this year but the appropriators do not seem interested in providing the money to buy that additional DDG, though they’ve yet to pass a final defense spending bill for the year. 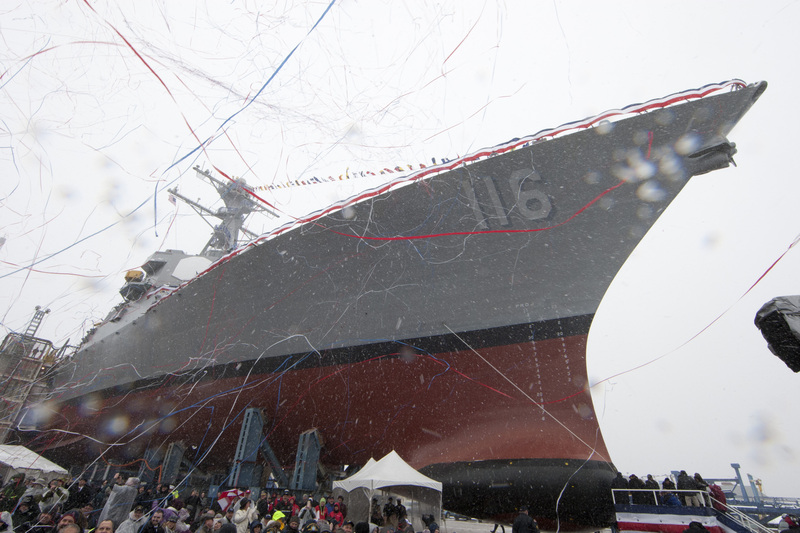 The five-year shipbuilding contract is planned to be awarded to the two builders, Bath Iron Works and Ingalls Shipbuilding, by the end of the current fiscal year. Capt. 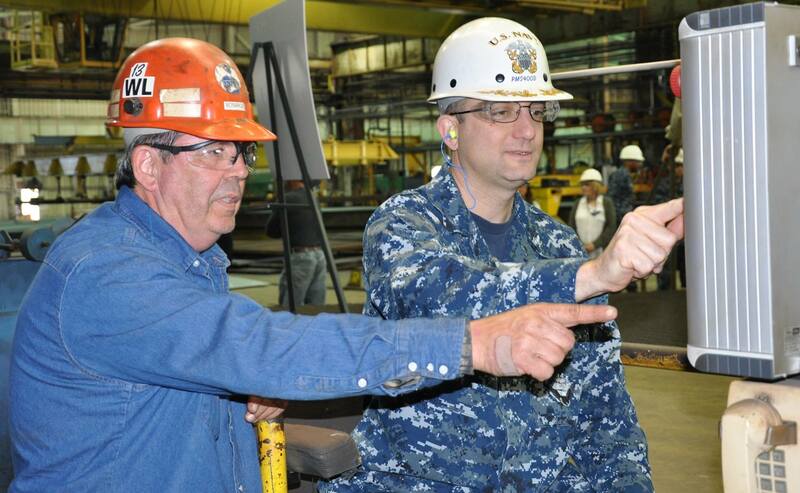 Casey Moton, right, program manager for DDG 51 Class, presses a button to begin fabrication of the future USS Lenah H. Sutcliffe Higbee (DDG 123) while Paul Bosarge, Huntington Ingalls Industries burner/work leaderman points and observes. The formal fabrication ceremony was at Huntington Ingalls Shipbuilding yard in Pascagoula, Miss, Wednesday, Jan. 25. US Navy photo. This FY18-22 contract would begin with DDG-128. The Navy earlier this year finalized a deal with Ingalls and BIW to insert the Flight III design upgrade into the end of the current multiyear contract, with hulls 125 at Ingalls and 126 at Bath being Flight III ships. DDG-127, which Congress added to Navy shipbuilding plans and incrementally paid for in 2016 and 2017, will be built by Bath Iron Works in the Flight IIA configuration. “The fact that both builders are on contract for Flight III, we think it positions us well for the next multiyear,” Moton said.